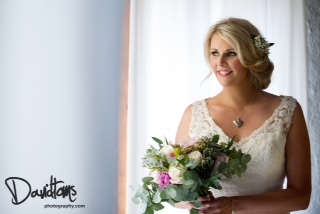 No wedding is complete without a glowing bride, and no bride is fully dressed until she has been fussed over and preened from head to toe by our top hair and beauty specialists. Today we are talking to Lorraine, one of the coast’s more recognised Hair and Make-Up Artists, about what makes her job one of the best in the world! Hi Lorraine and thanks for talking with us today. So tell me, how did you get into being both a hair and make-up specialist? I began almost 10 years ago at the Castillo de Monda, an inland castle and wedding venue in Andalucia, where they needed a specialist. Fortunately my experience garnered from abroad gave me an advantage over local stylists. The venue loved the fact that I was able to provide the full treatment and service menu of an inner city Hair & Beauty salon, something that other specialists in the area were not experienced enough to offer. I set up on my own and I’ve never looked back. You sound like you really enjoy your job. What’s the best thing about working with brides? That’s easy – being part of one of the happiest, most important days of their lives. I see a wedding day as a red carpet event, with the bride as the star of the show. I don’t live in LA, so to me making a bride look a million dollars on her big day is the next best thing to styling a celeb. A wedding is an amazing production that lasts for just one day, so it’s vital for me to get everything right. There’s no room for error. I have to produce the best makeover the bride has ever had and make her the most beautiful version of herself. The best thing about working with brides is that they bring out the best in me. I’m a high achiever and I strive for perfection every time, which is why my biggest thrill is seeing a bride love her new look and walk down the aisle looking stunning. What is the strangest/funniest thing that has happened to you at a wedding? There is so much fun and laughter in the room that nothing really stands out as the funniest. Although the strangest thing to have happened to me last season was the music choice as I prepared a bride at a wedding I was working at. Normally we have music in the prep room that gets everyone in the room going – tapping their feet, singing or even dancing. I also find it great for me too as it gets me in the ‘zone’. But on this day? Well, it was like a kind of classical music with whale cries. I thought it was a joke at first, but looking at all the women’s faces they seemed to be enjoying it. Obviously the day is about the bride and what she wants, so I had to close my mind to the irritating sound and work through it. Needless to say I had my pumping tunes back on full blast when I got back in my car afterwards! You clearly love to have fun and enjoy the glam of your job. If you could restyle someone famous from the past, who would it be? That’s a really tough one! I don’t know about restyling though because stars of the old screen were already famous for their striking looks. However, to style people from the present to look like the stars of the past, that’s something I WOULD LOOOVE TO DO! I loved Marilyn Monroe and Rita Haywood. Their hair and makeup was iconic and an inspiration for generations to come. Thank you so much for chatting to us Lorraine. Join us in Part Two to discover what Lorraine’s Plan B was, and get her hair and makeup tips for looking amazing on your Spanish wedding day!